If you continue to utilize the legacy CPM portals, follow these steps. If you are using the Pega Customer Service Interaction Portal, you can skip this section. Review all non-Perform harnesses defined in your Application rulesets (including Review, Confirm, and New). Update custom harnesses to remove references to any style sheets referenced on the Scripts & Styles tab. If you continue to utilize the legacy portals, follow these steps. If you are using the Pega Customer Service Interaction Portal, you can skip this section. This procedure ensures that your application uses the new CPMPerform harnesses, which are designed to work with the new skin and portals. The CPMPerform harness includes core wrapper sections for the interaction, work, and action areas. It is recommended that instead of modifying the CPMPerform harness directly, you customize the sections included in the CPMPerform harness to meet your site-specific needs. 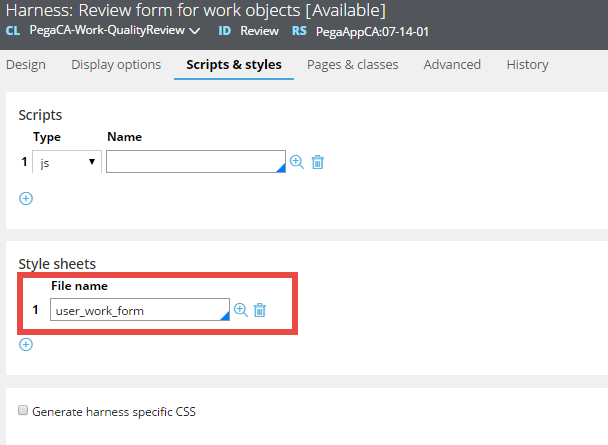 If your application uses sections that are not called from Pega 7 Platform harnesses, then you need to include workformstyles in order for them to be rendered properly in the Pega Customer Service UI. Because of extensive changes to the CPM skin and style sheets, if you have incorporated inline styles into your custom sections, your application’s displays might look inconsistent or unattractive with the new skin applied. Once the configuration tasks in this document are complete, review your application functions and remove any inline styles as needed. The CPM portal gadget, CPMPortalGadget, controls the type of work that can be processed, as well as the behavior and appearance of tabs. You must configure this gadget to reflect your site-specific interaction work types and classes.